Worldwide tide gauge comparisons show no acceleration in sea level rise | Watts Up With That? Just in case somebody could be interested in understanding if the climate scientists are telling us the truth about sea level acceleleration, there is still the opportunity to verify by using the tide gauge data in the PSMSL data base. · The above relative rates of rise are obtained by linearly fitting all the monthly average mean sea level data 1900 to 1975. The relative rate of rise is the slope of the fitting line. · The above relative rates of rise are obtained by linearly fitting all the monthly average mean sea level data 1900 to 2014. · Surprise, surprise, no major changes …..
· Do you spot any significant change? · Those that are claiming the sea levels are rising sharply than ever before at an accelerating rate are simply not telling the truth. · This may realize (for now) downloading and analyzing the PSMSL data, or even analyzing the data online. · In a few years’ time, also this data base will be corrupted and the truly measured data will be replaced by computations or reconstructions. March 19, 2016 in Sea level. So, tide gauges restricted almost entirely to N. Europe and USA coasts give us a reliable indication of GLOBAL sea level change do they? How about using satellite-based instruments with global coverage instead? It is more or less the same countries that express the most concern, so it is fair to look at the gauges in these countries. I don’t care if the oceans contain more or less water, but i care about the level at the shores, especially my shore. I live close to the shore in Danmark as most does, but think of the time involved. How many houses may be rebuild/mowed before it is a problem. Plus, given the fact that there is no acceleration indicated, any rise that is happening has nothing to do with man made CO2 level increases. CAGW is unscientific , correction, anti- scientific nonsense. It belongs with voodoo, naturopathy, horoscopes, politics and other disreputable pursuits. Bingo. Sure, there are places where sea level is rising faster than other places, but those are due to tectonic changes. The sea level rise DOES impact these areas, but even if there was zero rise from warming, they would still be grappling with tectonic sea level rise. If warming did add another 1mm per year, its really irrelevant in the big picture. I can’t think of any example of an area that would be fully able to adapt to natural sea level changes, but can’t adapt to fossil fueled changes of 1 mm per year. Sea Level Controversy from Nature published paper that is ignored by IPCC cult of CAGW ‘scientists’. Maximum mass and volume estimates from melting and expansion supports a sea level rise of 0.5 mm/yr not 3.0 mm/yr. Note the Antarctic ice sheet is gaining mass not losing mass. The rate of twentieth-century global sea level rise and its causes are the subjects of intense controversy1–7. Most direct estimates from tide gauges give 1.5–2.0 mm/yr, (William: None IPCC cherry picked tidal gauges in two independent peer reviewed papers gives 0.5 mm/yr and 1.0 mm/yr whereas indirect estimates based on the two processes responsible for global sea level rise, namely mass and volume change, fall far below this range. Estimates of the volume increase due to ocean warming give a rate of about 0.5mmyr21 (ref. 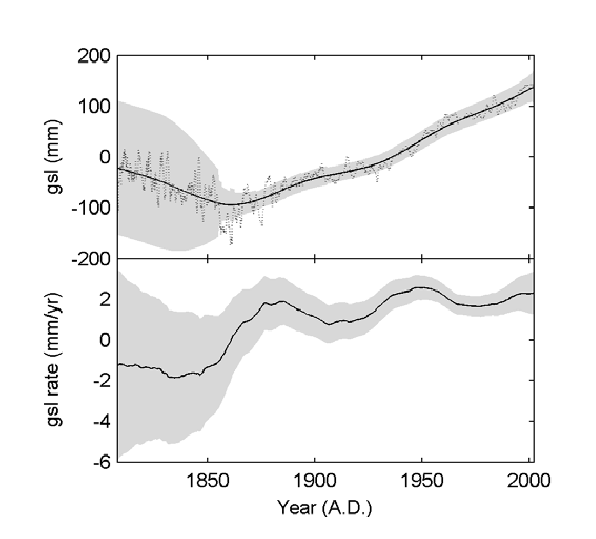 8) and the rate due to mass increase, primarily from the melting of continental ice, is thought to be even smaller. Therefore, either the tide gauge estimates are too high, as has been suggested recently6, or one (or both) of the mass and volume estimates is too low. OH no, more dumb layman data analysis. Before I go into that here is what rigorous analysis of tide gauge data shows. This if from Jevrejeva 2014. She does the usual genuflections to the orthodoxy by reporting that there is evidence of acceleration. She just avoids pointing out that NONE of the acceleration happens in the 20th c. let alone the part humans are allegedly responsible. But you have to read the paper, not just the abstract as Sturmbandfuehrer Cook would surely do. I recommend actually reading the paper. As for what is wrong with Albert Parker’s effort: firstly, Since the mean trend is calculated for each period separately and subtracted, all this shows is that *distribution* of *relative* changes between these sites has not changes. It tells us nothing about the average trend itself which may be more or less but has been subtracted out , so it tells us nothing about it. Secondly even if we did compare long term trends over different periods. this would not tell us whether there was any real acceleration anyway since like all the obsession with “trends” in climatology it depends upon the start and end dates chosen and tells us nothing objective. As the Jevrejeva graph shows there is a substantial circa 60y variation so comparing a short and long period can show “acceleration” even on a non trending function like a cosine. Anthony , I realise you don’t want to commit as much time as you used to to running WUWT but please vet submitted articles for common sense. The content of this site is taking a nose dive with some of “guest essays” that have been published recently. It used to be a reliable source of good information. Greg, the problem with averaging sea levels at different sites is similar to measuring a global mean temperature anomaly. Without measurements spread out evenly where local land movement is small, the average is meaningless. Parker has done something similar to what I was about to do before finding out that the data has already been adjusted. Few examples of changes in the rate of uplift or subsidence occurring in the second half of the 20th C would occur so the majority of data sets should show a common change in rate of sea level rise. I would have taken 30 year linear trends of all stations going back from the present for each station and plotted a histogram of the difference between the last 30 years and the prior 30 years. Its not just the average but since the majority of stations would not have had a change in the rate of uplift or subsidence, there should be a tell tale sharp peak if it were true. As Fort Denison 2 appears to have been adjusted, I didn’t bother checking the others for myself. Without measurements spread out evenly where local land movement is small, the average is meaningless. There are very few locations where geology is really stable. That is what Jevrejeva”s work tries to address. She does not give an open, reproducible account of her methods, only general description, so I can not validate here work and I am not aware of anyone who has done so. However, she does make a good effort at attacking the problem. I suggest you read the paper linked above. 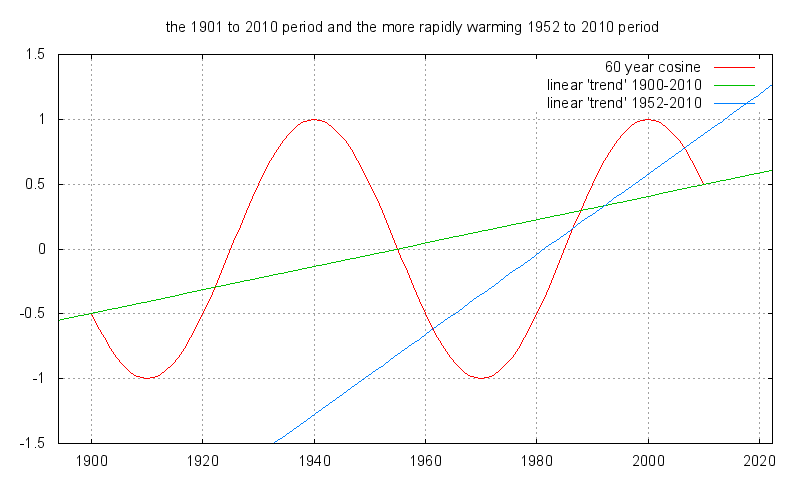 Linear “trends” are meaningless in the presence of cyclic variability. If we banned the word from whole field of climatology we may start to make some progress. If you took a 30y trend ending in 2005 and a 30y trend ending in 1975 you would presumably conclude “acceleration”. All these linear “trends” are a mugs game. Anyone can click “fit trend” in Excel. That is why it is so popular. That gives the false impression that it mean something. It doesn’t. Tide-gauge data is used to estimate change in sea level relative to land and most of Scandinavia has been rebounding upwards since the last glacial maximum, 20,000 or so years ago. During many millennia, mantle rock in the lithosphere was displaced southwards by the weight of the huge Fenno-scandinavian glacier. This caused a forebulge some distance from the glacier. As the mantle rock flows back north, the fore-bulge continues to subside causing a rise in relative sea level. Depending where you live in northern Europe glacial rebound in the lithosphere causes land along the coasts to rise in some places and to subside in other places. OH no, more dumb layman data analysis. I was under the impression that Mr. Parker merely used the online trend program provided by the non-layman PSMSL. While I’m on the subject, Jevrejeva 2014 also calculates simple linear trends (see Fig 7, for example). However, I am less disturbed by linear fits to the remarkably steady sea level rise over the past century than I am by Jevrejeva demonstrating “acceleration” by second order polynomial fits to records anchored in the Little Ice Age (see her Fig 16). Good greif, talk about cherry picking! I can’t think of any example of an area that would be fully able to adapt to natural sea level changes, but can’t adapt to possible* fossil fuelled changes of 1 mm per year. Auto – not a model-worshipper. I’m aware of the problems with fitting linear trends to data where its far from a nice linear trend with a little noise but with many stations, if acceleration was occurring then it would show up in a histogram. The average wouldn’t be meaningful. Worth watching all of it. Not so fast my friend. Even if the actual gauge Is accurate to +/- 3mm – and that’s not the kind of unit that was around decades ago, so comparisons to past levels of sea level reside are difficult – it doesn’t take account any changes in elevation to the unit itself. What good is a tide gauge accurate to +/- 3mm if it’s installation is changing up to 25 mm/yr in elevation? Has anyone done a study on the relative sea level changes between hard rock and soft sediment coastal areas? 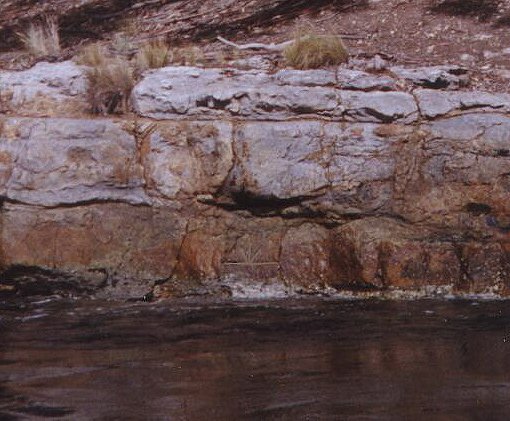 Soft sediment areas should show a much higher rate of change due to the effects of drawing down the water table for irrigation, industry and drinking purposes. In addition, recently deposited, soft sediment, areas are constantly compacting under their own weight, adding to the perceived rate of change in ocean levels. It is not surprising therefore that Holland, Belgium and the Mississippi Delta Area are showing the highest rates of change. The adjustments to the satellite altimetry data are greater than than the millimetres being measured, so it is important the the adjustments are based on accurate model of what how the satellite system is constructed, notably the optical path length (especially the drift in time) between the satellite and the surface, and the way to splice successive satellite data. Unfortunately there is insufficient agreement on the model. Envisat/Topix/Boulder/Portugal give different answers. With satellites they get good global coverage free from tectonic factors, but insufficient precision. Tide gauges give precision but cannot give global results because the land holding the gauge goes up and down by an insufficiently accurately known amount. When I heard in the media that they would use satellite to measure see level, I thought it was either a joke or some misinterpretation by the journalist! And people seem to accept that “science” is so great and miraculous and magical that this can be done. Considering that the velocity of e-m waves depends somewhat on the density of the gas they are travelling through, and satellite orbits are perturbed by gravitation and solar wind, I find it hard to believe that distance measurements can be as accurate as that. From electronics testbench experience, one of the problems of digital instrumentation is that the resolution of an instrument may be much greater than its inherent accuracy, and this may lead to undue faith being placed on the readout. To pretend that you can work out mean level of an ocean with a swell of several metres by reflecting a beam of the BOTTOM of the swell and guessing magnitude of the swell is FARCICAL. This uncertainty is not something which will average out globally because the same problem exists globally. It all depends on tuning of the highly complex process of converting distance to bottom of swell to mean sea height. In short you can produce whatever results you want. Also, I remember reading somewhere that the findings are all subjected to classic alarmist homogenisation techniques in order to provide sufficiently scary results. How the heck do satellite measurements of ocean levels adjust…? Wow! Talk about homogenisation on steroids. Has anyone, without a pre-determined alarmist bias, professionally reviewed these to determine their validity? Do satellites provide any usable information? Supposedly. Hundreds of posts at this site base analyses of atmospheric temperature on satellite data. A lot of people here believe the satellite records for this metric are superior than the thermometer records. Atmospheric temperature is a more difficult metric to winnow than sea level. By that account, the answer to your question would be: depends who’s talking. The no sarc answer is – yes, of course. Satellites are used for intercallibration with land measurements. No data set is perfect, but the more you have the more you can narrow things down. They also measure solar irradiance effectively, and can perform observational tasks of things above the clouds better than land-based instruments – less interference. I guess that you are one of the “polio was eradicated by a vaccine so you must get the flu shot” guy. You must be for or against vaccines! Nobody here believe that satellite can sense your living room better than thermometer. The local station is the best place to measure local conditions. Global warming isn’t about the temperature in the living room. Sea level rise will flood Manhattan isn’t about the energy content of the Atlantic ocean. So now you are saying all the above was sarc and you didn’t mean it? So because temp satellite provide better information, we should trust other satellites that don’t even agree with each other? And how do we know which “adjustment” is valid? Lower atmospheric temperatures are derived from radiance measurements of O2 from several different channels representing different slabs of the atmosphere, each many kilometers in depth. It’s a proxy measurement of temperature that has to derive temperature of a slab of the lower atmosphere by combining/subtracting other channels that measure well up into the stratosphere. Sea level measurements are directly measured from sea surface (infrared bounce) with a height window of a few meters (tide/swell). The processing steps for temps are more numerous and more onerous than for sea level height with respect to satellites, with an altitude difference of several orders of magnitude. Both metrics have challenges in common, too, like satellite drift, orbital decay etc. Satellites provide better coverage. We should not automatically defer to any one set of measurements, but calibrate against each other to narrow uncertainties. That’s why more data sets are useful. That’s why satellites are useful. They are an additional – not replacement – observation set. Tide gauge records go back to 1850, long before anyone thought about global warming, realistically one measurement from one place would give a good indication, when you go to a clinic they measure you temperature at one ear, not all over your body. None of the satellites show the same level, they have to be adjusted to show the same, and they have algorithms based on tide gauge levels. Me I believe the tide gauges thank you. Indeed, the tide gauges averaged over the globe give a solid reality check on the modern Sea level change and rate blurb. If you go back to the 1992 IPCC ‘report’ scare-campaign to governments and institutions, they made a big deal about two things, temps and sea level change, in 30 and 100 years forwards of 1992, and the rates of change predicted were frankly small and ordinary. At the time I remember thinking is this what they’re worried about? There are higher known rates from natural regional (ice loads changing on land leading to relative isostatic change) and also global change. The figures were about what you’d expect from background natural variability, due geodynamic movement and climate variability. But they made it sound like a new global ’emergency’ was pending. I would have been surprised if such changes didn’t eventuate, both regionally and globally, in 30 and 100 years, from natural variability alone. Nevertheless, an average of the available raw continuous tidal measurements in harbors globally does undercut and negate theoretically fanciful, or else satellite based claims. Precision of satellites does not mean much if it is not calibrated to the real world ground measurements. Otherwise you get error presented as signal. Satellite data is and always must be ‘ground-truthed’ against the actual surface measurement, otherwise the data has no reality or validity. So ground-truthing of geodetic satellites in this case is historical tidal data and VLBI site vertical movements in a region (both of which are spotty but there are enough to obtain a global average vertical movement in the +/- 1 mm level annually). If the satellite data does not match the tide data, then it’s the satellite that is reading the tide, or rather local sea level change rate, wrongly. If however, the global tide range varied little or not at all, but the VLBI and Topex datasets varied vertically by a much larger positive amount, even after they were calibrated properly, it would mean the Earth’s diameter was increasing, by several mm per year, not merely a relative sea level change with respect to land. In other words, the interpretation of the signal would be what’s wrong, not the data sets. So if tide gauges largely don’t change, but calibrated satellites say sea level is going up much faster than tides capture, then the earth would have to be increasing in size due to internal changes or cycles. So is that what their sea level change data is really capturing? A global diameter change? If the tidal data says there is no significant tide level change, that would be the implication of the satellite signals. Warmer-worriers will of course try to retrospectively rig the tide data, but if they can’t, they must downplay its relevance and disparage its accuracy and try to ignore it in favor satellites and their creative-fiction predictive change models that pretend to be the real world measure of the planet, and that the actual measurements no longer matter. But the tidal gauges always matter, and they will always trump every other form of sea level measurement. However, also keep in mind that in recent decades many harbors have had a lot of development springing up in, on and around them and the weight placed upon unconsolidated muds, clay and sand also makes surrounding fixed installations slowly begin to sink into the sediment and the local crust to slightly depress, which probably accounts for much of the ‘rise signal’ in modernized old harbors with many of these gauges anyway. It certainly will apply to the USA, Australia and Many European harbor gauges. So a simplistic presumption can not be made that apparent sea level change is actually due to a thermal change of water, combined with melt water. It ain’t necessarily so, and a rise signal in a port may simply be sediment and structure settlement. Venice and Mississippi delta area, plus coastal Bangladesh, even Jakarta and Tokyo are examples of subsidence, due to the weight change of construction, or younger sediment deposition at high rates pushing crust down, tectonic crustal down-warp, plus aquifer extractions, etc. All is not actual sea level change. And only a relative comparisons plus an average global movement of sea level from tide gauges, can provide the reality checking needed here. Few years back at TROPMET symposium, former Dyputy Director General of Forecasting [DDGF], Dr. P. K. Das [after retirement working in the West] was felicitated for his great achievements. He presented a big speech after the falicitation. I asked him a simple question, do our seas are rising or falling. He replied back saying, we have 12 tode gauges along our coasts and of them 4 show a fall and 8 showed no change — I quoted in my research papers & books a decade back. Later group working for IPCC reports changed this and tried to say sea level is rising. Along the Indian coasts, against CRZ rules, developmental activities destroyed the coast, Mangroves, considered as protective walls from tidal fury associated with cyclonic activity. Drilling for Oil & gas also creating subsidence in the Earth along the coasts. Every scientific assertion in the IPCC reports is incorrect. The assertion that ocean level rise is accelerating is only of many assertions which are obviously not supported by the data. Niño Southern Oscillation of 1997/1998, a naturally-occurring event, the sea-level trend is zero. reaching identical conclusions: sea level is barely rising, if at all. Guyana, Venice, Cuxhaven, Korsør, Saint Paul Island, Qatar, etc. is a further indication of political tampering with scientific evidence about sea level. facts are to be found in nature itself. The IPCC authors take the liberty to select what they call “representative” records for their reconstruction of the centennial sea level trend. This implies that their personal view—that is, the IPCC story-line prescribed from the beginning of the project—is imposed in the selection and identification of their “representative” records. With this selection methodology, Douglas (1991) chose 25 tide gauges and obtained a rate of sea level rise of 1.8 mm/year; Church et al. (2006) selected 6 tide gauges and obtained a rate of 1.4 mm/ year; and Holgate (2007) selected 9 tide gauges and got a rate of 1.45 mm/year (Fig. 2). The mean of all the 159 NOAA sites is 0.5-0.6 mm/year (Burton 2010). A better approach, however, is to exclude those sites that represent uplifted and subsiding locations (the bottom left and top right zones in Fig. 4). This leaves 68 sites of reasonable stability (still with the possibility of an exaggeration of the rate of change, as discussed above). These sites give a present rate of sea level rise of ~1.0 (± 1.0) mm/year. This is far below the rates given by satellite altimetry. That is an interesting question. I believe if I understand the issue the sea level rise will be dependent on the slope of shore. For regions where there is not continental shelf such as an island in the ocean, sea level will be directly dependent on ocean temperature. For a region along the coast of continent, where there are continental shelfs, such as Florida I would expect thermal expansion to have no significant effect. The assertion that there has been no significant increase in sea level rise due to the -0.7C rise in planetary temperature makes senses, based on the physics and constraints of the problem. Ice buildup on the Antarctic Ice sheet has stopped as the ice sheet covers the Antarctica Mountains. As the elevation of the ice sheet increases it cools at roughly 3C per thousand feet. The ice buildup on Antarctic has stopped as it too cold to snow. The average summer temperature in center of ice sheet is –29C, average winter temperature -66C. When Antarctic warms up the ice sheets increase until there is significant warming. The warming the AGW paradigm pushers have been discussing is an Antarctic peninsula that is warmed by winds carrying heat from the ocean. IPCC say it is “likely” (66-100% probability) sea level rise has accelerated since 1900. The IPCC simply does not know. Measuring MSL is notoriously difficult. The best SL measurements come from numerous tide gauges. When dozens of tide gauges are averaged, from all points around the globe, they show nothing unusual is happening. But the IPCC says it’s ‘likely’ that the long term, natural rise in sea levels is accelerating. They are paid to say that. It’s astonishing how easily some folks just fall to their knees and begin worshiping government agencies. Have you no self respect at all? The only honest kind of scientists are skeptics. Only a fool would blindly accept the self-serving proclamations of the IPCC, or of any similar organization with the same kind of remit. Governments hired those scientists to produce a predetermined result, and that’s exactly what the IPCC is doing. What possible reason could you have for defending that kind of scam on the public? No argument from me that sea level acceleration is difficult and uncertain. Just pointing out that IPCC do not flat-out claim it is definite since 1900 (ie, not an ‘assertion’). I don’t think it’s well-established either. I’ve read a lot about it, though I’m no expert of course. I don’t make the common mistake of favouring one or two studies that present one side of the argument… the ol’ single-study syndrome and its derivatives. What nonsense is that, Bill H. — Sea levels ARE truly global. Water is always level, see !!! It finds its own, accurate height automatically – as you must have learnt at primary school, Bill H.
It’s a little more complicated in a dynamic system. Actually, the Pacific side of the Panama isthmus is 20cm higher than the Atlantic side. The equator is 21 kms higher than the poles due to the centrifugal force of rotation. The land masses have more gravity and thus pull some of the ocean toward them. 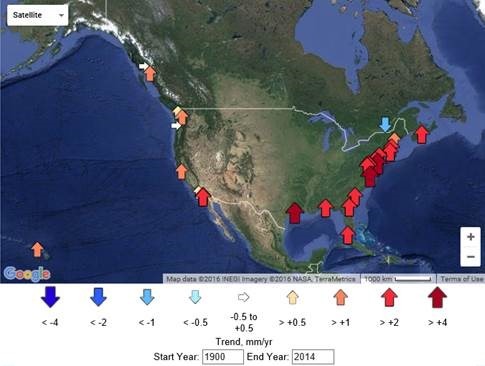 Sea level can fall or rise by 10 mms depending on whether it is warmer or colder than normal. Some areas of the planet have more gravity and thus sea level is lower etc. These are all big problems for a satellite measuring sea level from 1336 km orbits. The idealized geoid accounts for the flattening at the poles and other more or less regular variations in the Earth’s surface. Therefore the surface of the world ocean fits closely the shape of the ideal geoid. But not exactly. Because the elevation of the ocean’s surface is affected by gravity. And there re irregular dimples and bulges where gravity is greater or less than average for the globe. For example, the Maldives are located in a “gravity well” about 200-meters lower than the “surface” of the geoid. This gravity well is a more or less permanent dimple in the real surface caused by a gravitational anomaly. The idealized geoid does not fit exactly the shape of the real Earth. This is one reason most GPS units do not measure elevation accurately, but instead display what elevation would be if the surface of land or water corresponded to the ideal geoid. To measure elevation a nd location precisely, including tectonics, special techniques are used, including reference stations. In my opinion, tide gauge elevations should be adjusted for vertical land movement caused by plate tectonics as well as other causes of land uplift and subsidence. Besides the effect of gravity there is also the effect of the differences in atmospheric pressure. Perhaps the most obviouse example of this is the mound of water that rises under the very low pressures found in tropical cyclones/hurricanes and which are a major factor in causing storm surge when such storms come ashore. Yes, I know of course that actual levels vary all over the world for all sort of reasons. That is all implied by talking about “eustatic sea level”. That is the level which is global at all times. That is what we are talking about here – not nit-picking about various local differences. I’ll let you supply the satellite data for the year 1900.
for sure tides gauges don’t measure sea level , but satellites measurements are not direct, they must be checked or cross validated… if some claims are made that sea live rise accelerates you can expect to see an acceleration in tide gauge measurments too… I know it is quite complicated because for instance thermal expansion, but….you only have one set of measurement of sea level…it must be validated. …How about using satellite-based instruments with global coverage instead? Since 2004 the Colorado University’s Sea Level Research Group has adjusted the rate of sea level rise upwards by almost a full millimeter per year. Didn’t they stop measuring ‘actual’ sea level, and switched to a WAG of what it would be if the land under the ocean wasn’t sinking due to the additional weight of the water due to sea level rising. Kinda. They now measure sea level as a function of volume. Isostatic rebound is still occurring from the last ice age, as land upwells and ocean basins deepen from the loss of the great ice sheets of that period. This has a negative effect on mean sea level height. They adjust for that at +0.3mm/yr. The reason they do this is in order to estimate global climatic changes, rather than just averaged sea level height. It’s a simple matter of subtracting 0.3mm for geodetic sea level if that’s the metric wanted. For local sea level, other factors come into play (local and regional land rise/subsistence). Hello Steve. Hope you’re well, my old sparrer. The GIA adjustment, which they started applying a few years back, accounts for some of the difference in your chart. It’s difficult to make out the chart is representing, though. The chart title is sea level 2004 to 2014. But the X axis starts 1994 and stops at 2004 (?). The rel1, rel1.2 don’t refer to different methodologies as far as I can tell. That’s the shortened form of the language they use for each of the data updates they do a few times a year (2004: Release 1, Release 2… 2005, Release 1, Release 2…. 2010 Release 1, Release 2 etc). I trust we don’t have to traipse through the criticism of data improvements routine. Everyone does it (UAH, RSS etc). Data revision is an everyday fact and good practice. If the question “is the data perfect?” is never asked and acted on, that would be supremely sloppy science. It’s worth pointing out that there are several other institutes processing the satellite data that come up with very similar results to CU. NOAA provide sea level estimate from satellites without GIA factored and get 2.9mm/yr +/- 0.4. Bill, there are tide gauges in the SH, such as in Sydney and Auckland, that have over 100 years of data and also show no increase in the rate of SLR. The problem with tide gauges for the alarmist camp is that they are an exact measurement and therefore cannot be adjusted in the same manner as the satellite data, which is really only an artifact of adjustments in any case. Tide gauge measurements may be adjusted depending on the purpose. Tide gauges only measure local sea level change referenced to the gauge. If the gauge itself is on land that is rising or falling, then it’s not a measure of geodetic sea level change over time. Say you want to know if global averaged sea level is changing. You know that tide gauges are not altitude static, that tide gauges are not geospatially equidistant, and that you can’t assume local land altitude changes cancel each other out. How would you go about estimating a global average? … you can’t assume local land altitude changes cancel each other out. You can if you have enough of them. With a few hundred tide gauges around the globe, some would be reporting subsidence, and some would show uplift. Averaging all of them would work because on average, the earth’s land areas cannot show a net rising or subsidence. If that happened the globe would either become bigger, or smaller. That is very easy to determine, and in fact, the globe’s diameter remains stable. Thus, a large enough tide gauge network would show what MSL is actually doing. But don’t wait for the UN/IPCC to spend the little money it would take to construct several hundred more tide gauges. That would show what the sea level is actually doing. They do not want that, because they know it’s very likely that there is no acceleration in MSL. So they will continue to publish their pseudo-science in hopes of scaring the public. There is no reason to assume biases would cancel each other out. Tide gauge data is sparse, especially prior to 1950 – there are not ‘hundreds’ that stretch from 1900, not even one hundred. And they are not evenly distributed around the globe. Long-term records are concentrated in Northern US and Northern Europe, where rebound from the last ice age is lifting the land. There’s barely a handful in the Southern hemisphere with long records. But I wouldn’t assume anything about overall bias from that. Detailed analysis needs to be done. Assuming data is perfect, or that biases would cancel out without actually checking would be very sloppy research. Maybe I wasn’t clear enough. I’ll try again. The UN/IPCC has an enormous budget. For only a modest expense, it could establish tide gauges in hundreds of locations covering the globe. The readings would average out subsidence and uplift, leaving the true ∆MSL. But they won’t do that, for the reasons I gave. They do not want an accurate reading of change in sea level. I think it would show that their remit is entirely political, covered with a thin veneer of science so the3y can sell their alarmism to the public. So measuring the rate of filling of water at one end of the bath gives us a reliable indication of the rate of increase of the depth of water at the other? For a bath? Well, yes, if you know the dimensions of the bath, or even if you know the dimensions of the bath above the waterline at some point in the filling. Quite a bit more complicated for the bath the continents are wallowing in, though! We use one CO2 measurement from one location to give us the GLOBAL CO2 content of the atmosphere. Well, it makes sense to measure SLR at the coast, rather than at the middle of the ocean. Satellites aren’t interested in the coasts. Satellite data only goes to 1979. To see if there is an acceleration, you need older data. If sea levels aren’t rising at the same rate everywhere (all continents share the same oceans) then you have to see what the LAND is doing. Land movement, up or down, is NOT considered part of sea levels rising. No real news here, but a nice way to present things, and alerting people to PSMSL availability is a real plus!!! In areas that have remained tectonically inert, neither sinking nor uplifting since the middle 1800s, while CO2 has shown a 40% increase, the inert zones clearly show an unchanging linear rise of about 1.2mm/yr. Thanks for that extremely lucid presentation, maybe the best I have seen on sea-level rise. I would send it around, but I found the talk by the Larouche woman, setting up the totalitarian Red Chinese government as some kind of utopian ideal, fanciful and even offensive. Though she did seem to agree that the ‘green revolution’ of the ’60s and ’70s was anti-progress, anti-intellectual, and anti-human, which is true, a point which should be made more often. But the UK Met Office says it is. Because the coasts are all that matter to folk that live on land? Different folk have different interests. If you want to answer questions on a global scale, reading your local tide gauge isn’t going to tell you anything. Tide guages have two problems. One is isotatic rebound from the last glaciation. Visible along western Europe and NA east coasy. Two is tectonics, very visible along PNW north America (especially Alaska). Both are correctile by finding the long term tide guage subset that is reasonably geostationary. That can be done using differential GPS over some years. Answer is about 1.8-2.0 mm/ yr rise measurement/ geostationary uncertainty), and no SLR acceleration in the last 45. Interestingly, this number does not give rise to the so called divergence problem. The sat altimetry valuess do. Suggests the sat altimetry has reasonable precision but not reasonable accuracy. Especially since explicitly not measuring shorelines. If the concern is that a warming planet will flood coastal areas, then it is IMPROPER to subtract out the isostatic rebound. If the lands is rebounding and making floods less likely, GREAT. What really matters is the sea level measured at the coast, not the volume of the ocean. If I have purchased property in Nova Scotia based on the idea that the AGW’ers tell me it will be oceanfront next week; who do I sue now that the ocean is farther away? Yes and no. The concern is future flooding caused by sea warming, not present flooding. Present sea level is a proxy for present sea warming. It is proper to subtract coast change. Present sea warming is used to check models used for future sea warming. Absolute sea level is relevant. What is the optimal ocean volume? It’s an absurd question, yet some seem to think that the change in ocean volume is the key concern. It just isn’t. The sea level gauge at The Battery New York has shown a straight line increase since Lincoln was president. Today’s sea level is no more good or bad or right or wrong than it was in 1850. Even if there is a small component related to warming, it is dwarfed by the natural changes. At least in new York city, which is often cited as a place where sea level rise from climate change could have major impacts, the tide gauge record shows that it truly is irrelevant. According to the IPCC (2013), sea levels rose at a rate of 1.7 mm/year (6.7 inches per century) for the 1901 to 2010 period, but 3.2 mm/year (12.6 inches per century) during the 18-year period between 1993 to 2010, a rate similar to that obtained from 1920 to 1950. Problematically, in recent decades the source contribution estimates for recent decades from published studies add up to half (or less) of this claimed rate for 1993 to 2010. According to recent estimates, the contribution to sea level rise from thermal expansion was 0.64 mm/yr (2.5 inches per century) for the period between 2005-2013 (Llovel et al., 2014, see below). The contribution from the Greenland (GIS) and Antarctic (AIS) ice sheets was 0.59 mm/yr (2.3 inches per century) for the 1992-2011 period (Shepherd et al., 2012). The contribution from global glaciers and ice caps that are not the GIS or AIS was 0.41 mm/yr (1.6 inches per century) for 2003-2010 (Jacob et al., 2012). Over the entire water column, independent estimates of ocean warming yield a contribution of 0.77 ± 0.28 mm yr−1 in sea-level rise … the deep ocean (below 2,000 m) contributes −0.13 ± 0.72 mm yr−1 to global sea-level rise [0.64 mm/yr total]. Since 1992, the polar ice sheets [Antarctica and Greenland] have contributed, on average, 0.59 ± 0.20 millimeter year−1 to the rate of global sea-level rise. Here we show that GICs [glaciers and ice caps], excluding the Greenland and Antarctic peripheral GICs, lost mass at a rate of 148 ± 30 Gt yr−1 from January 2003 to December 2010, contributing 0.41 ± 0.08 mm yr−1 to sea level rise. These sources add up to about 1.6 mm/year, which is the equivalent of a little over 6 inches per century. Interestingly, this is the same or slightly less than the rate for the entire 1901 to 2010 period (1.7 mm/year, IPCC), meaning that sea level rise has not accelerated in recent decades according to the summation of source estimates. Additionally, if we include the Zwally et al., 2015 paper, which indicated that net gains for Antarctica negatively contributed to sea level by -0.28 mm/year between 1992-2008, sea level rise contributions drop down to 1.3 mm/year, or 5 inches per century in recent years. 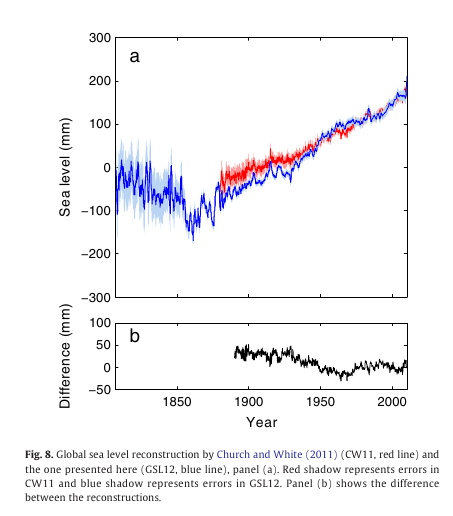 Wasn’t there a paper in the Journal of Geophysics – Oceans in August 2010 with the same conclusion – no acceleration of sea level rise in the past 100+ years? Looks like the Climate “Change Scientists”, if we can call them that, are again caught red handed! Yes. It was politically rejected. So sad. The only changes I noticed between the sets of tide guage maps was that the Canadians had a new one on their west coast. Which will lead to another “pause” when the fudged data comes more into line with measurements. Scientists today are reporting on one of the most intriguing cases of a shared hallucination to have ever been recorded., All across Britain and Northern Europe peole have woken up to find they have been hallucinating ‘snow’ – and apparently its feels just like the ‘real thing’. as Mrs Crombie from Abergavenny says , ‘I opened my door and there it was, snow, just like I remembered it’. However climate scientists have reassured the public,that it isn’t snow, it’s just a group hallucination: ‘It’s basic philosophy of science’, said Professors Green, ‘Occam’s Razor is the principle. For it actually to be snow we would have to rewrite the whole science of climate, and invalidate years and billions of research, Occam’s razor says that the far more simple explanation is a simple shared hallucination’. A Mr Monckton, of Brenchley, in his dotage was heard to mutter “Eppur sta nevicando” before he was put in an ambulance and taken back to his re-education centre. Scientists have said that this sort of hallucination is what happens when people listen to ‘deniers’ and is further proof that anyone in a liberal tolerant society should maintain an extreme level of vigilance and intolerance towards anyone who challenges Accepted Science. ‘Otherwise who knows where we would be, if we just relied on so-called ‘common sense’, and our subjective experience, to tell us what is going on’. Looks like the Climate “Change Scientists” have been caught red handed again! Why compare 1900-1975 with 1900-2014, rather than with 1975-2014? That would highlight the acceleration better. Exactly so, by compare 1900-1975 with 1900-2014 the accelerated rate of rise over the more recent decades is diluted into the earlier longer period. Comparing 1900-1975 with 1975-2014 Does show a faster rate of rise in the second period. I’m left wondering why Albert Parker chose to do the comparison in the was he did. shoreline, aiming to conceal the fact that its location indicated that sea level had not been rising. Scientists pursue the truth, even inconvenient to their favored hypothesis. Criminals conceal evidence that could endanger their livlihood. So what’s the global average using the tidal gauges? Is it more than 5-7 increase in inches by 2100 if it continues as is? I didn’t see that in the article. I didn’t see Nils Axel Morner (sea level data expert) quoted in the article. Maybe I missed it…Isn’t it data that we want, rather than models? I have always wondered about ocean currents and their drivers, and what the effects are on local sea levels. Any ideas? In a few years’ time, also this data base will be corrupted and the truly measured data will be replaced by computations or reconstructions. 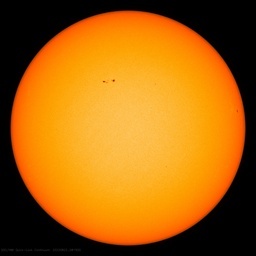 There is an opportunity here for climate watchers to take snapshots of the entire raw data sets and put them in independent long term archives. It would be proof against the type of editing and adjustment of the past which trashed the surface temperature records. For example, people go on and on about the pause/not pause, and it was warmer/not warmer than 1998. but people seldom look back further. The way the period 1900-1975 was portrayed in 1980 is totally different from the way it is portrayed today. Independent archives of the raw data would put a stop to a lot of that nonsense. See also the results of the SEAFRAME gages. Since I live on the coast and I think the sea level rise bed-wetters are a bunch of liars, I prefer to just go and look at it to know what’s going on. Me too here in Cape Town Phil; nothing changed in 60 years. These guys think we are dupes. Location in a geologically stable area. Photos of the Statue of Liberty construction on Bedlow’s Island show no change in sea level since 1880s by direct observation. Photos of sea level at the Brooklyn bridge towers in 1880s show no change in sea level since then. Regarding the 2nd chart it’s a question of whether or not the uptick since 2012 is going to continue or not. Just ten years were plotted out because the earlier and shorter time spans are distorted by short term variations. Was there a single correction that accounts for all/most of the recent acceleration or was it a Karl-esque multi-stage rocket process? And what about the tectonic moves on the deep bottom of the seas? Let’s imagine a long range of underwater volcanoes beginning erupting and spitting huge volumes of lavas on their slopes or whatever uprising of the bottom. An uprising of one meter of the bottom on millions square kilometers for one century may bring a consequent uprising of the sea levels too. Will the oceanographers be able to notice when a 4302 meters depth became 4301 instead in the same place half a century later? I don’t think so. Where is the effect of erosion and sedimentation taken into account? In Norfolk UK, lots of cliffs have fallen into the sea over time. All of that plus sediment washed from rivers along with space dust must go into the sea. If I have a bowl of water and pour quantities of earth/sand into it the level rises. Don’t forget all the stones kids throw in the sea at the beach. That must be allowed for as well. I would imagine in any model that is assumed to be constant, or have some algorithm adjustment attached to it. What is important is the contribution to sea level increase due to the warming caused by CO2. I don’t see how you can make the case for CO2 is the rate of sea level increase isn’t increasing. The evidence shows that with an increase in CO2 caused warming the rate of sea level increase actually decreased, meaning that AGW is actually delaying the flooding of Manhattan. Al Gore must be disappointed. Is that Auckland, New Zealand (NZ), I see in some of the images? Hey, did these people know Auckland sits on some ~60 extinct volcanos? NZ also sits on a very active geological/tectonic region, so there is a constant flux in land levels relative to sea levels? What I find very strange is that I cannot find tide gauge data adjusted to land uplift and subsidence for the last years. To talk about accelleration is meaningless without adjusted data. Do anybody know global tide gauge dataseries for the last years (2000 to 2016)? The biggest problem with the tide gauge data is that the database managed by PMSL is just so hard/impossible to work with. It would take months of data entry to put it all together so that you could come up with the average annual change in sea level. It is the modern area of massive databases, so one would think they could make it user-friendly. But they do not. On purpose I assume so that people can’t actually know what the tide gauge database says. Then there is the issue of local land uplift and local subsidence which must also be factored in. There is NO place on the planet that is vertically stable. But there are now up to 384 Tide Gauges that are co-located with GPS stations (operating for long enough to provide useful information – it takes about 4 years for a solid vertical uplift/subsidence number to become apparent). This table shows the Vertical land movement (V_GPS) for the stations. Sonel.org is the agency keeping this database. Unfortunately the GPS station ID name is not the best to know where it is so one has to use this table as well to match up the ID to the location and then to the local tide gauge it is co-located with. Battery Park/Sandy Hook (SHK2, SHK5) is actually sinking by about 1.6 mm/year to 3.6 mms/year so the tide guage at Battery Park measuring sea level increase of 2.84 mms/year is essentially measuring no change in real sea level at all. I tried to use the info from Sonel and PMSL to get to annual average sea level change from the tide gauges adjusted for local vertical changes. The issue is they keep changing the gauges in the co-located database. If one is trying to calculate a “1.5 mm/year”, switching out 10 sites can make all the difference. I tried to keep the same locations in over time (manually removing the changers – needless to say – too much work), but what I found is that sea level increase, adjusted by GPS, was fairly stable at 1.4 mm2/year up until 2010, when it started increasing to about 2.1 mm2/year and has been to 2013. Thank you for your reply. It seems so difficult that I had feared. And it is strange, compared to all the effort that goes into climate science. Surely that is irrelevant. Tectonic processes are slow and essentially invariable; that said all we need to know is whether the rate of change is varying. If it isn’t at many tide gauges around the world then sea level isn’t really varying much. The first derivative tells you what you need to know. Sorry if its already posted…. render readings which would make the wave reading satellites useless. way to track actual sea levels over time. Sorry Bill. My comment was written while you were adding the answer to my question. If the concern about sea-level change is based on the fear of flooding, then has aerial and statellite photography shown significal changes in shorelines? And for the pre-sattelite era, comparisons between successive editions of nautical charts ought to reveal historical trends. This is one of the smoking guns of global warming. If in fact the earth’s temperature is increasing at an increasing rate, one would expect that the glaciers would be melting at an increasing rate, therefor the sea level should be increasing at an increasing rate, ceteras paribus. That isn’t happening. The oceans are also warming so there should be some thermal expansion of the oceans, which would raise the sea level. The failure to show an increasing rate of sea level increase, the fact that the oceans are warming, and the fact that temperatures don’t correlate with CO2 is pretty solid evidence that something other than CO2 is causing the climate change. magnetic field has contributed to the sea level rise? The Fifty year trend peaks around 1950. Surfing around the world at this site makes for an interesting afternoon, IMHO. Note the differences between Lewes, DE and Cape May, NJ which are just across the mouth of Delaware Bay from each other, a good indication of the subsiding coast of NJ vs that of Delaware. I don’t understand your claim. How have the average trends been “subtracted”? As far as I can see he is reporting the average trend. I also don’t understand this objection. Yes, trends depend on start and end dates … but how does that make them useless on your planet? In any case, the best way to poke holes in papers is to demonstrate and support your objections to the method. However, you have not done any of that. Instead, you’ve just claimed that their method is wrong, without the slightest attempt to either demonstrate, support, cite or back up your objections in any manner. More to the point, this is not a place where Anthony publishes perfect scientific papers. Nor is it even theoretically possible to do so. Instead, it is a place where people can poke holes in scientific papers, because that is how science progresses. Rather than the arrows, can you give us exact numbers? It is possible that the arrows are hiding an acceleration. Not surprising that Scandinavia is rising and Northern Germany is sinking, just like the first two charts show. 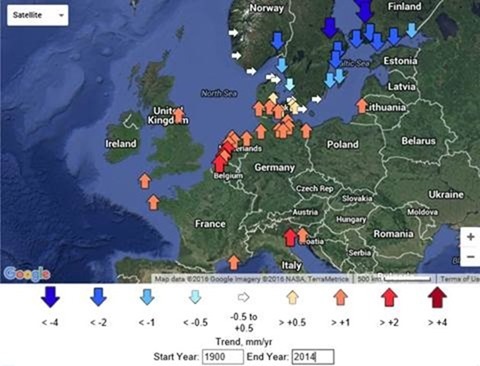 Scandinavia was under heavy burden of snow during the ice ages and is still rebounding from it. The same is true of Laurentide ice sheet in North America. Changes lijke the ones in Europe are also taking place in the Great Lake region. One result is that some lake basins are slowly being tilted and are spilling water from their south margins. If you are going to measure sea level changes keep a good distance away from any formerly glaciated coasts and make allowance for the water held back in artificial reservoirs. Chao, Yu, and Li did that and published it in Science in 2008. They found that correcting for reservoir storage made the sea level curve linear for the preceding 80 years. The slope of this linear section was 2.46 millimeters per year. Anything that has been linear that long is not going to change anytime soon. 2.46 millimeters per year works out to just under ten inches per century. This is what I expect the century’s sea level rise to be. Bear in mind that Al Gore pronounced the sea level rise to be 20 feet per century and prognosticated that this will wipe out the state of Florida. When he got a Nobel Prize after mouthing that trash I knew something was wrong with the organizations controlling such prizes. I was proven right when it turned out that the MacArthur genius prize for 1992 went to Stephen Schneider for revising the IPCC FAR report in 1990, for which he was an editor. The journal in which I read it printed both the original and the revised section involved but I was too stupid to pick up the difference and thought both of them irrelevant. Schneider was interviewed and he said the prize came just in time because he was in the middle of a bitter divorce. Later I tried to trace that article but Google will not give it to me. Checking Wikipedia tells you he was married to Terry Root and nothing about a previous marriage. And James Hansen also got a prize in 2001 for his stellar performance in 1988 in front of the Senate. Prize giver in this case was the Heinz Family Foundation. These are just examples I happen to have run into of global warming advocates being financially rewarded by institutions supporting the global warming cause. I keep getting into these conversations and being called all manner of bad names, accusations of being in the pay of big oil, or people saying I’m just plain stupid. But I too have been digging through the tide gage records for some time. None of the excuses work. All of the adjustments are easy to check and basically involve land use changes…land use changes that would not apply to small island stations, which also show no signs of sea level rise accelerations. The tide gage record is a big thorn in the side of global warming alarmists. It is truly the ultimate “No, you’re just wrong” to the whole thing. Oh really…so much more energy going into the ocean you say, and where is that magical thermal expansion? Oh really…so much more glacial melt that you claim is impacting sea level rise as we speak…but where is this magical water? It is simply not present. The oceans also represent a bit of a problem in terms of warming…they simply can’t. All you need to do is a simple check of the numbers…claimed energy imbalance (no matter how high), the volume of water in the oceans, the specific heat capacity of water. It would take 500 years at current rates to heat the oceans even 1C. And even that isn’t a diagnostic number…that’s just an example. These people aren’t claiming it will warm by 1C, they’re claiming quite a bit more more. And it’s just physically impossible for it to happen before almost all of the CO2 is removed again through natural forces (even if sensitivity was as high as they claim). And these people never seem to learn..and outright refuse to think. They won’t let the fact that the math simply does not add up stop their belief…instead they just send links of some other “scientist” who is also seem incapable of doing this very basic math. Land use changes refer to forestry, agriculture, urbanization and the like. What you mean is land height changes. Islands aren’t immune to tectonic changes. The tide gauge record shows global sea level rise of 18cm since 1900. The fact that it rises with early 20th century warming, dips with mid-century flat temps, and rises again in the last 40 years or so is hardly a thorn. Long-term global sea level appears to track long-term surface temps pretty well. Plenty of shorter scale variability, though. Strong ENSO events can have a significant impact for a couple of years, for example. You’re confusing projections of near surface air temps with the oceans. No one is claiming the seas will warm 1C by 2100. The oceans have 1000 times the heat capacity of the atmosphere. A temp change of 0.01C in the oceans transferred instantly to the entire atmosphere equates to a temp rise of 10C. No one is projecting nearly that much temperature rise by 2100, not even at the high end of projections. At current rates it would take more than a thousand years to warm the entire oceans by 1C. Less than 10% of worldwide coastline is covered in the analysis. Less than 1% of the seas. And the periods overlap. Better to have done 1900-1975 and then 1975-2014 n any case, comparing two distinct periods. Here’s the result for Europe. Pop them in adjacent tabs, if you like, to click/compare a little easier. First thing to notice is that quite a few tide gauge locations in 2014 don’t have any data prior to 1975. I couldn’t spot any tide gauges that have a slowing trend post 1975 in this analysis, but some have increased trends. Also, the negative trended stations (around Scandinavia where the land is lifting relatively quickly) are either stable between the two periods, or the negative trend is decelerating. Not much change. Increased rate in a couple places. Again, far fewer tide gauge locations on that map prior to 1975. I didn’t bother with Australia, as there was only a couple of data locations on those maps prior to 1975. Probably a good idea to include the caveats on that page. John Daly link is broken. Is it a formal study, or a blog piece? And is it about location?? Dispute over a couple of tide gauges in Tasmania hardly puts the debate ‘to rest.’ You can’t extrapolate a couple of data points in a tiny location for global. Curious about Tasmania’s tectonic history (land height changes), and knowing that it is one of the closest bits of land to Antarctica, I went searching for information. Tectonic uplift is another factor for Tasmanian long-term tide gauge records, as would be localised vertical land changes. Also, el Nino causes short-term sea level rise globally, so the “full-blown” el Nino referred to in the John Daly article may have raised mean sea level. But it also could have lowered sea level. 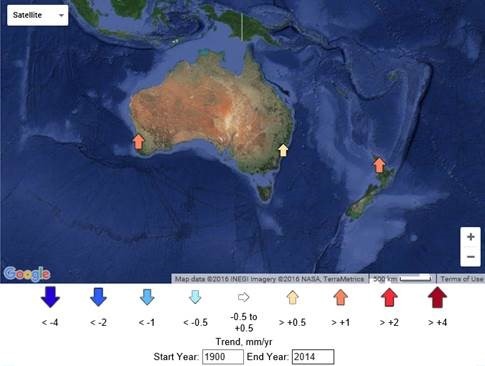 Effects are not uniform for every el Nino, and el Nino effects are suppressed in Tasmania due to proximity of the Antarctic, which has a moderating influence on short and long-term global changes. I admire the diligence of the author, but as I read through it raised as many questions as it answered. As for the checking of alternative written records, it has been investigated at length, and there is more information. On 1 July 1841, Ross and Lempriere had a standard survey mark cut into a sandstone cliff on the Isle of the Dead. The mark is a horizontal line with a broad arrow touching and pointing down at the horizontal line. A plaque was installed above the mark, but unfortunately it has not survived. Ross’ journal of the event is confusing. It is not clear whether the mark was made of the mean sea-level, or high water. Ross did make two more marks on the Falkland Island on the same voyage, and these were both above mean sea-level. A paper published in 1889 by Captain Shortt recorded the wording of the plaque, including the time the mark was struck and the height of the sea given by Lempriere’s tide gauge. By taking a measurement of the height of the sea, and estimating what the tides were when the mark was made, Shortt determined that the mark was made near high water. An article in The Australasian in 1892 also recorded the wording of the plaque. While almost the same as the version published in Shortt’s paper, it differed in the time the mark was supposed to have been made, although both reports were consistent regarding the reading of Lempriere’s tide gauge when the mark was struck. Taken on its own, the reported time of the striking would suggest that the mark was originally near mean sea-level. Significant work has gone into determining which of the accounts is correct, including a current major study by a collaboration of international scientists, as knowing whether the mark was originally placed near mean sea-level or high water is crucial to being able to compare sea-levels of 1841 with today. This study has concluded that it is almost certain that the benchmark was originally placed near high water. The conclusion is based on other estimates of sea-level made later in the 19th century, and on the fact that, if the mark had originally been placed near mean sea-level, then the Penitentiary building would have suffered flooding every few years (there is no record of this having happened). I’m surprised no one has mentioned John Daly. This article puts to rest the ‘accelerating sea level’ scare. Current high tide is very close to the same. In almost two centuries, the sea level rise has been less than ten centimetres. NOAA has a website “Tides and Currents” that gives data for 128 tidal gauges for the U. S. and 112 additional tidal gauges for the rest of the world. Data goes back for some locations back to 1880s. Their data shows no acceleration from 1990 to present.